A key link in the Apple supply chain is reportedly looking to build its next plant in the heart of dairy country. According to an Associated Press report, Wisconsin officials are hashing out the details with Foxconn representatives, although no further details were reported. 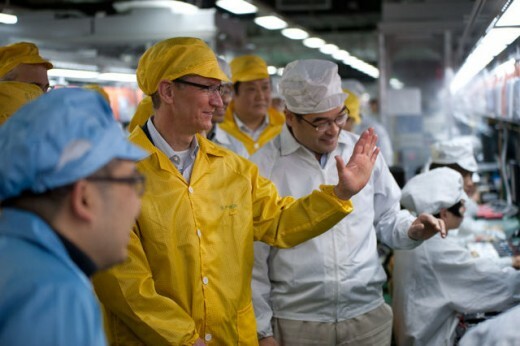 Apple products are part of a global supply chain, but Foxconn handles the final chassis assembly. The Taiwan-based factory is also the subject of numerous instances of bad press: from underage workers, to poor wages, and even a rash of suicides that put the company on the tip of all our tongues. 2010 was a particularly bloody year with a total of 14 suicides. All but one of these deaths were due to a fall from the upper floors, or roof, of the assembly factory. The oldest of the deceased was 28, the youngest just 18. Things have improved at Foxconn since, but the implementation of so-called suicide nets may have played a larger part than improved working conditions. An NYU student detailed the working conditions of these types of plants — this time at another Apple supplier, Pegatron — earlier this year. He reported 60-hour work weeks and monotonous labor — often done while standing — for a mere ¥3,100 ($450) a month in wages. And now the factory is coming to the United States in a deal that could be worth as much as $7 billion. The Associated Press also reported it could create as many as 50,000 new jobs — all of which would provide higher pay and better working conditions than its Asian counterparts — by law, not by choice. According to Foxconn Chairman Terry Ghou, this move has been in the company’s plans since 2014, although we doubt that’ll stop Trump from taking credit for it. There’s also no guarantee the factory would take part in the assembly of Apple products, as costs would undoubtedly rise if assembled domestically. Ghous, in past interviews, stated the plant intends to build flatscreen displays, and makes no mention of Apple specifically. The move could still prove interesting if Apple is somehow involved. But for now, we just don’t know.